This article is about the food. For the band, see Huevos Rancheros (band). Huevos rancheros (Spanish pronunciation: [ˈweβoz ranˈtʃeɾos], "rancher's eggs", "mexican chili") is a popular breakfast dish consisting of eggs served in the style of the traditional large mid-morning fare on rural Mexican farms. The basic dish is composed of fried eggs served upon lightly fried corn tortillas topped with a tomato-chili sauce. Refried beans, Mexican-style rice, and slices of avocado or guacamole are common accompaniments. As the popularity of the dish spread beyond Mexico, variations using wheat flour tortillas instead of corn and pureed chili or enchilada sauce instead of tomato-chili salsa have appeared. Non-Mexican additions such as cheese, sour cream, and lettuce also have become common beyond the dish's native range. 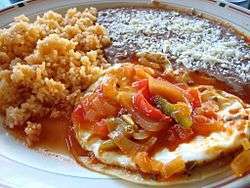 "Huevos divorciados" (divorced eggs), are simply two eggs served in the same style as huevos rancheros but with a different sauce for each egg – usually a salsa roja and a salsa verde. Somewhat similar dishes are huevos motuleños of Yucatan and New Mexican enchiladas montadas. ↑ Kuhn, Shannon (April 4, 2013). "Another day at the ranch". Anchorage Press. ↑ Lin, Andrea (February 17, 2012). "Good Morning, Sunshine". Albuquerque Journal.